From the ‘Once upon a timeless tale’ series published by Little Hare books, Beauty and the Beast offers a timeless tale of love, integrity and duty. 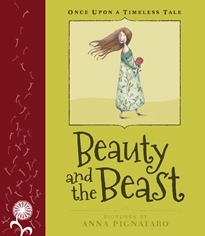 Retold by Margrete Lamond (from the original story by Jeanne-Marie Leprince De Beaumont), with full page illustrations by Anna Pignataro, Beauty and the Beast is attractively hardbound, and would make a good stocking-filler or gift book for readers who might like to collect the series. Pignataro’s illustrations are a striking combination of watercolour and collage, with still-visible sketch-lines that give them movement and immediacy. The muted colours mixed with snippets of vintage fabric also highlight the artwork’s handmade quality; and effectively complement the story of a once-wealthy merchant’s daughter, who is condemned to live out her life with an unappealing suitor. The personal qualities of the cast are well contrasted by Beauty’s two aspiring, and later, bitter and jealous, sisters, while Beauty is characterised by her consistent humbleness and loyalty to her father. She willingly sacrifices herself to live with the Beast, and, in time, comes to fear him less. As with many beloved fairy tales, things are not what they appear to be – but Beauty is ultimately rewarded for her honesty and open-heartedness. This telling of the well-known tale is refreshed with light humour, and condensed to the length of a middle-grade reader – also making it an ideal book for busy grownups to enjoy over a cup of tea. With illustrations that evoke the mystery and opulence of the Beast’s mansion and the drama of the dilemmas faced by the characters, this charming version of the classic tale will be sure to please.